Found/Made is an exhibition at the San Jose Museum of Quilts & Textiles, which I was asked to guest curate. It opened on July 11. There is a reception open to the public on July 26 from 2 to 4 PM, and the exhibition closes on November 1, 2015. I hope you can come enjoy these amazing artworks and quilts. I had the pleasure of installing the exhibition the week before it opened, and I'm very excited to share these quilts and artworks with you. Here's a peak of last week's hard work. Thank you to the museum staff and all the wonderful volunteers! The old things I found in our basement, the garage, or my grandmother’s home around the corner in a small town in Indiana, delighted me. These objects represented the vestiges of an earlier time. They enthralled and intrigued me, and I was hooked. A forty year involvement with quilts as a dealer, publisher, and author, all led to the creation of the quilt collection found in my latest book, Unconventional & Unexpected: American Quilts Under the Radar 1950-2000. The fascinating connection that quilts have to modern and contemporary art has always been a theme in my quilt investigations. There has always been an ongoing dialogue between artists and quiltmakers; and Found/Made explores borrowed strategies and aesthetics, experimentation and risk-taking, and unusual and quirky materials. The exhibition’s “found” pieces are curated from multiple collections. The “made” pieces are contemporary artworks from artists who make quilts and art that has a connection to quilts. 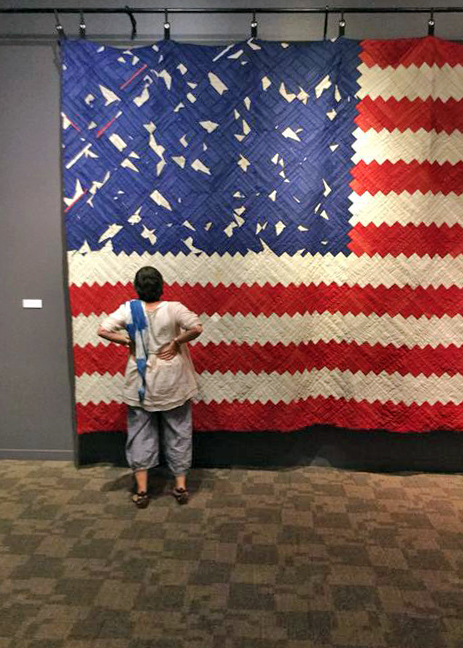 This thought-provoking exhibition offers the audience an opportunity to look at quilts in ways they may not be familiar with and to see them presented in new ways. These quilts and works of art converse with and play off of one another. The quilts that grab our attention and question traditional quiltmaking make up Found. Eccentric, odd, and unpredictable quilts highlight the improvisational quality that quiltmaking is. Why did she use coral-colored thread to tie a blue denim comforter? Where did another maker find those off-the-wall fabrics? Additionally, Found/Made features quilts from the collections of historian and quilt authority Julie Silber, established collector Marjorie Childress, and artist Allison Smith. Many “made” pieces come from artists whose practice includes quiltmaking. Ben Venom repurposes Harley Davidson and heavy metal t-shirts to create intense yet intricately pieced quilts. Therese May’s portrait quilt also explores figuration with its piecing and repurposed fabrics. Sarah Nishiura’s quilts play with abstraction as she crafts delicate geometries. One of her pieces is used every day on a bed and will find its way onto the wall for Found/Made. Luke Haynes recently exhibited with Ben Venom and Joe Cunningham at the Los Angeles Craft & Folk Art Museum. His pieces in Found/Made use quiltmaking, a practice closely associated with American history, to question it. Meanwhile, Joe Cunningham’s pieces recall American art history, especially Abstract Expressionism. He cut up found, painted canvases to construct Bed, after Rauschenberg as homage to the Rauschenberg combine that incorporated an actual quilt. Jonathan Parker utilizes canvas and wool to remind the viewer of the human form in his small abstractions. A recent recipient of the Joan Mitchell Award, Clay Lohmann uses quilt-like surfaces for drawing and painting, creating artworks somewhere between an unstretched painting and a quilt. Quilts have a definite conversation with collage. Dana Hart-Stone collages photo emulsions onto canvas, creating meticulous patterns. Photography also meets the quilt in Sabrina Gschwandtner’s light box piece, which she made from filmstrips that she received from the filmmaker of Quilts in Women’s Lives. Unruly (History Series) by Amy Trachtenberg plays fast and loose with materials as she collages on canvas in a manner that feels so similar to the compositions in many quilts. Found/Made is a conversation about the exchanges between quiltmaking and art-making. A quilt might be quite different than what the viewer expects. Art-making may borrow from the long history of quilts (and so many other disciplines) in America. All of these pieces create that same sense of visual play and wonder as those small discoveries of my childhood in Indiana. I would like to thank the collectors, artists, and galleries loaning this wonderful work: Susan Baerwald of Just Folk, Brian Gross Fine Art, Jane Levine, Jack Fischer Gallery, Holly Ellis, Kevin King, and Matt Gonzalez.